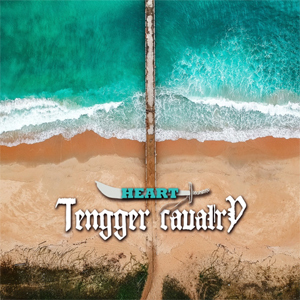 After their split up right after the release of the latest album Cian Bin February 2018, TENGGER CAVALRY have gathered their forces and return with a big bang. The Nomadic Folk Metal pioneers led by mastermind mastermind Nature have renewed completely and strike back with their new single "Heart", which is available as the regular 13-minute version and as a shortened radio and music video edit as bonus track. "It is a long 13 min track featuring multiple nomadic folk artists from China and few amazing American musicians. As the song title suggests, it is a song dedicated to all of my fans who put their hearts into what they truly love and believe"
Watch the first video of the regrouped band on KNAC.COM HERE. Read the full story about the rise, fall and new rise of TENGGER CAVALRY HERE. "After a long break, it is great to feel like creating what I love again. Moreover I am more than grateful to have all the band members, friends, fans and ppl around me to give a support for relaunching the band. It is more than a passion. It is a cultural project that I intend to share with everyone and I will do my best to keep on going. Last but not least, I want to thank Napalm Records for believing in me and giving me time to heal even when I was in my darkest hours." TENGGER CAVALRY, or "the army of the sky god", teach the greatness of a unique sound symbiosis: With their mighty mix out of Mongolian overtone singing and violin empowered folk metal, these New York mind blasters create something very special. They are not just a Billboard-featured metal band, but also the symbol of nomadic warrior spirit that connects fans from all over the world.